Understanding funeral flower etiquette is important when deciding how to express your sympathy. When we think of funerals, we often think of flowers. However, different religions and cultures dictate when and where funeral flowers are appropriate. Flowers are a part of many funeral services. Your professional florist can be of assistance when deciding the type of sympathy arrangement to be sent to the funeral home or to the family residence. Preference in flowers, colors and types of arrangements may be different in different regions of the country. When considering religious and cultural funeral customs, the professional florist filling your funeral flower order will help you with an appropriate selection. VASE OR TABLE ARRANGEMENTS are usually funeral flower arrangements sent to the bereaved family’s home or taken home after the service. Choosing this type of arrangement can reflect the deceased’s tastes, style or personality. If uncertain as to the type of funeral flower arrangements to send, a discussion with the florist will help you with your selection. FUNERAL FLOWERS FOR AN INFANT OR CHILD are usually smaller than regular funeral flower arrangements. The color theme may be that of soft pastels or of bright sunny colors. Funeral flower arrangements, sprays, bouquets, wreaths, angels and crosses are considered appropriate. FUNERAL FLOWER WREATHS come in a variety of floral or other types of designs. Wreaths bring a special meaning to the service. The circular shape of the wreath is the symbol for eternal life. Crosses are also considered appropriate. FUNERAL FLOWER CASKET SPRAYS come in an assortment of sizes. The two most common sizes are either full-length or half-length sizes. The full-length arrangement extends over the full length of the closed casket lid. The half-length arrangement covers the bottom half or the closed portion of the casket during an open casket funeral. The family usually orders funeral flower casket sprays. FUNERAL FLOWER LID ARRANGEMENTS can be small floral bouquets, corsages or other types of small arrangements. These types of funeral flower arrangements are usually ordered by the family and represent the children or grandchildren of the deceased. FUNERAL FLOWER SPRAYS are delivered to the funeral home. Funeral flower sprays may be ordered from a wide selection of flowers and themes, and are presented on an easel during the service. LIVE PLANTS are often welcomed as gestures of condolence and sympathy. Live plants can be sent to the funeral home, the residence, or even to the office. SYMPATHY GIFT BASKETS containing flowers, plants, kosher, gourmet or specialty foods, and gifts are appreciated by family and colleagues. These types of baskets are delivered to the family residence or to the office. These types of baskets are not usually delivered to the funeral home. SYMPATHY CARD: The Enclosure or Sympathy Card lists who gave or sent the flowers. On the back of the card the florist will list the type of arrangement, along with a description of the flowers, plant or sympathy basket. The etiquette of sending funeral flowers differs by religion and custom. Understanding the type of service will help in your decision of whether or not to send flowers. If you are uncertain about the type of religious service, or the cultural customs of the deceased, then it is advised that you ask the family’s religious leader, the funeral home director or a professional florist. Military Funerals usually follow these practices: When the flag is draped on the casket, then only standing sprays are used. Funeral flowers arrangements with ribbons in red, white and blue are often requested for a patriotic theme. Military symbols can be used with the funeral flower arrangements. Japanese Services usually follow these practices: The incorporation of lots of flowers is used in the funeral service. 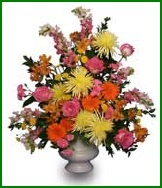 It is considered appropriate to send flowers to the funeral home, such as large standing sprays and floor arrangements. Cremation Services usually follow these practices: Funeral flower arrangements are generally considered appropriate. It is often recommended that you check with a member of the deceased’s family, the florist or the funeral director as how to best express your sympathy. Roman Catholic Services usually follow these practices: It is considered appropriate to send flowers to the funeral home such as standing sprays, floor arrangements, standing arrangements, crosses and hearts. Sympathy gift baskets of fruit and food may be sent to the deceased’s residence, but not to the funeral home. Church of Jesus Christ of Latter-day Saints (Mormon) Services usually follow these practices: It is considered appropriate to send sympathy cards and flowers. Funeral flower arrangements in the shape of a cross should not be sent. Baptist, Episcopalian, Lutheran, Methodist, Presbyterian and other Protestant Services usually follow these practices: It is considered an appropriate expression of your sympathy to send flowers, cards and charitable donations in memory of the deceased. Buddhist Ceremonies usually follow these practices: Flowers are considered appropriate; however do not send red flowers. White flowers are considered the symbol of mourning. Understanding funeral flower etiquette is important. Talking with a professional florist can help answer your questions. The family and friends who have lost a loved one will appreciate your appropriate expression of sympathy. Sending funeral flowers is easy with FlowerShop Network Directory of real local florists in the United States and Canada. I didn’t know that part of funeral flower etiquette was that arrangements for smaller children were different sizes than for adults. Do the types of flowers also change if it is for a child instead of an adult? I hope I never have to plan a funeral, but this is good to know if the need arose. Sunny colors that convey happiness and brightness are appropriate in any funeral flower arrangement for a child because of the joy and sweetness we all associate with youth. To achieve this feeling, florists often use sunflowers, daffodils, yellow roses and yellow tulips. Occasionally blossoms are combined and shaped to honor a specific hobby or special interest of the child. Flowers can be arranged in the shapes of angels, crosses, hearts, ballerina slippers, toy trains, teddy bears, and footballs, among many other things. Ordering a customized funeral arrangement is a wonderful tribute if you’re close to the departed. Thanks for taking the time to read our blog, hopefully you won’t need to use this information! I’m going to a Mormon funeral on Wednesday and I have never been to one of those before. However, I am glad that you mentioned that funeral arrangements in the shape of a cross should not be sent. I was honestly considering sending one just like that and now that I know that I should not, I will make sure to send a simple flower arrangement. I’m going to a military funeral for the first time. I’m a family friend. I’ve always brought flowers to traditional funerals but I’m unsure if I’m supposed to bring them to this type of service. Or should I just send them to the home of the family? We are sorry to hear about your loss. For military funerals, most of the time the American flag is draped over the casket. Since the flag is there, it is best to send a sprayed standing floral arrangement to the funeral. If you feel more comfortable sending the arrangement to the family’s home then that works too. You could even send an American themed floral arrangement to the funeral.